← Keep it Light! SanDisk’s Cruzer Glide 128 GB USB – Replacing External Hard Drives? Even when companies like Nuance have been coming up with serious software such as the Dragon Dictate for PCs, desktop speech recognition programs have not taken off as well as their mobile counterparts – think Siri on iPhone 4S. The problem with computers is that they lack appropriate hardware to match speech recognition requirements. Microphones on laptops are built for communication and therefore do not meet the precise requirements of the speech recognition software. 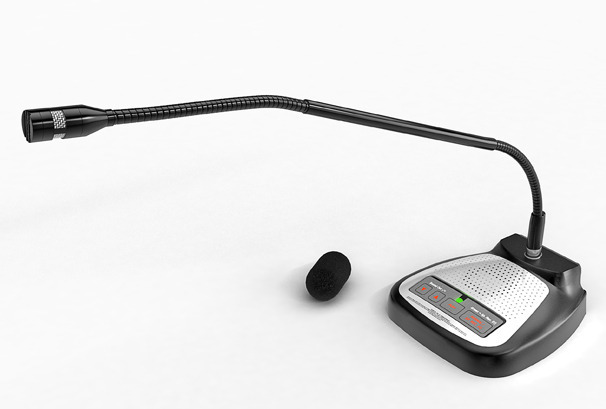 Speech Recognition Solutions, a company that makes microphones that specially caters to speech recognition needs has introduced the SpeechWare 6-in-1 TableMike which has been specially made with a superior microphone featuring noise-cancellation technology. This makes it possible to carry crystal clear sound over the mic to your computer which makes it easy for the speech recognition software to decode the information from the sound. The SpeechWare 6-in-1 also has a USB port to support an additional peripheral device, an on-board speaker, a 3.5mm audio jack, a microphone input to support additional microphones and an optional foot pedal to control the device. The SpeechWare 6-in-1 TableMike is USB based and therefore could connect almost all the computers and also supports Windows, Mac as well as Linux. The device has been made in such a way as to be so sensitive enough to support speech recognition and also make it ideal for communication purposes. There are 3 modes on the device – Speech Recognition mode, Normal mode and Accessory Mic mode. When in the Speech Recognition mode, the mic will be extra sensitive and you can pick up your speech when placed even 20 inches apart from where you are speaking. Normal mode is ideal for voice recording and VOIP calls. Accessory Mic mode is to be used when you want to use another mic in place of the in-built microphone and but would like to use the noise-cancellation technology provided by the SpeechWare 6-in-1. The hardware is pretty slick and flexible for everyday use with a detachable boom that bends at 2 points – just above the base and just below the tip making it easy for positioning the mike. The SpeechWare 6-in-1 draws power through USB and does not need additional power cords or batteries. The device retails for $309 and the optional Foot Pedal is priced at $79. This entry was posted in Articles, USB Devices, USB Gadgets and tagged microphones, Nuance, Speech Recognition Solutions, SpeechWare 6-in-1, SpeechWare Microphones, SpeechWare USB 6-in-1 TableMike, SpeechWare USB 6-in-1 TableMike Review. Bookmark the permalink.